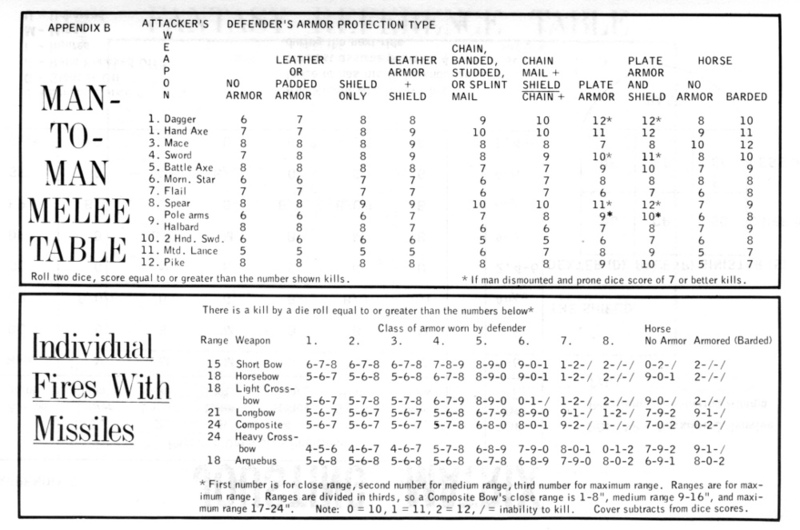 The previous column looked at what the OD&D books have to say about using Chainmail's combat rules. One piece of the Chainmail puzzle is still missing: an article from issue #2 of The Strategic Review titled "Questions Most Frequently Asked About Dungeons & Dragons Rules." I'd forgotten about this article until Jeff Grubb reminded me of it over Chinese dumplings. Thanks, Jeff. Chainmail is primarily a system for 1:20 combat, although it provides a basic understanding for man-to-man fighting also. The "Man-To-Man" and "Fantasy Supplement" sections of Chainmail provide systems for table-top actions of small size. The regular Chainmail system is for larger actions where man-like types are mainly involved, i.e. kobolds, goblins, dwarves, orcs, elves, men, hobgoblins, etc. It is suggested that the alternate system in D&D be used to resolve the important melees where principal figures are concerned, as well as those involving the stronger monsters. But that's not why I bring up this article. The important bit for this discussion is the next paragraph. When fantastic combat is taking place there is normally only one exchange of attacks per round, and unless the rules state otherwise, a six-sided die is used to determine how many hit points damage is sustained when an attack succeeds. Weapon type is not considered, save where magical weapons are concerned. A super hero, for example, would attack eight times only if he were fighting normal men (or creatures basically that strength, i.e.,kobolds, goblins, gnomes, dwarves, and so on). This is a crucial paragraph because it clarifies a big question from the OD&D rulebooks about the number of attacks per round. It's easy to conclude that every character and monster, in each of the four combat systems, gets attacks equal to its HD every round; I knew people who played that way. This paragraph makes it clear that in the ACS at least, an attacker gets multiple blows only if the enemy is a basic, 1 HD creature. By extension, we made the same assumption for Chainmail combat wherever possible. This clarification has a chilling ramification where 1st-level characters are concerned; if they're no different from any other 1 HD creature, then their lives are fragile indeed when they meet monsters with two or more hit dice. 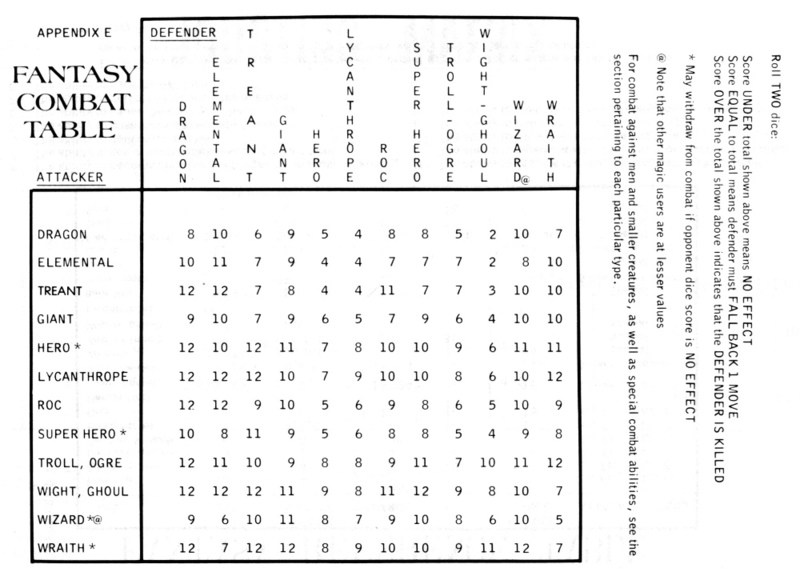 The Fantasy Combat Table is the most straightforward of the Chainmail options. It works as described in Chainmail. 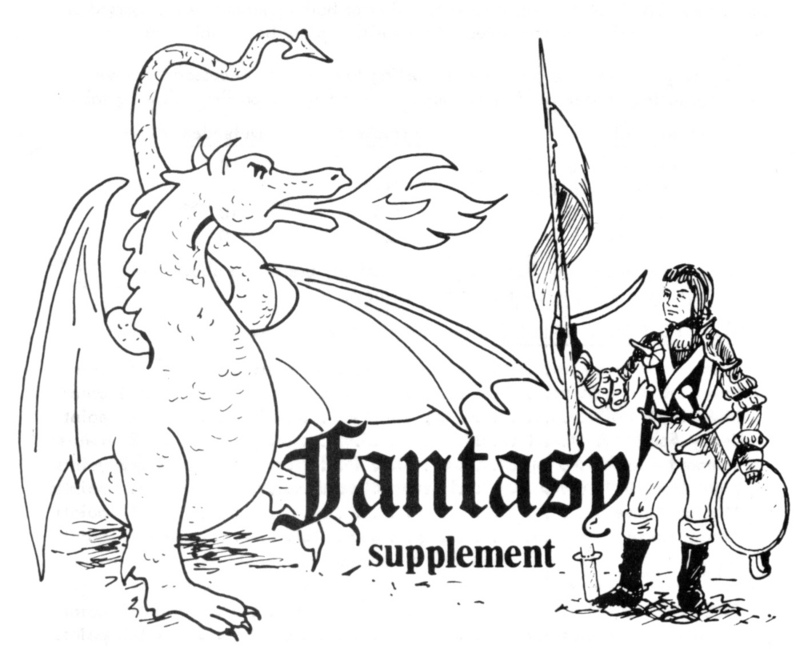 A magic weapon adds its bonus to the attack roll and magic armor subtracts its bonus from the attacker's roll (an extrapolation from Chainmail, page 38, "Magical Swords" and "Magic Armor"). The FCT has one big disadvantage in that it's so limited. Only nine monsters are covered. The DM can add more, if he's willing to extrapolate; there are no guidelines for expansion. The table is simple, which helps. Confusion arises because the table contains no provision for normal men; the lowest-level characters it covers are heroes (level 4 fighting men or level 7 clerics; at one level lower they fight as "hero -1") and wizards (level 10 magic-users; they reach hero -1 at level 7). Chainmail implies that characters have a -1 penalty for each missing level, so a normal man/1st level fighter must fight as a hero -3. Players quickly discover that the FCT is brutal to anyone below hero level. If you wait until fighting men reach level 4 to use the FCT, that still leaves magic-users and clerics in a tough spot. If you wait until the clerics and magic-users reach level 7, then you're not getting much use out of the table. Then again, the FCT is geared toward fighting high-level monsters, so waiting until characters reach high level makes some sense. It's just not especially useful. The 20:1 rules are my favorites. 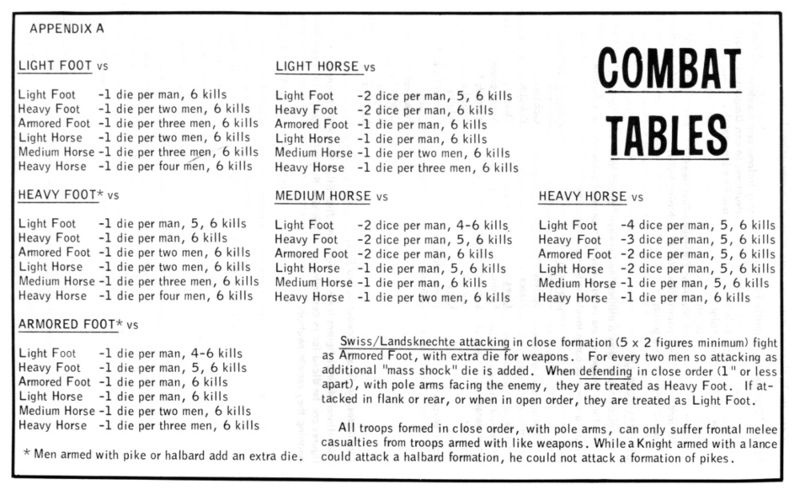 They use the combat tables on page 40 of Chainmail, which define everything as light, heavy, or armored foot, or light, medium, or heavy horse. Each type gets some number of d6s and scores hits on a 6, 5-6, or 4-5-6, depending on who's being fought. For example, heavy foot fighting light foot gets 1 die per man and hits on 5-6. A level 5 fighting man has the fighting capability of five men; if he were classed as heavy foot and fighting enemies classed as light foot, he would get five dice on the attack and each roll of 5-6 would be a hit. Ranged attacks are quirky but not confusing; you just need to believe that the Missile Fire table means what it states. We adjusted the odds a bit so bows would be more useful to low-level characters. A magic weapon gives an extra attack (per Chainmail, page 38); we enlarged that to one bonus die per magical plus. Chainmail offers no advice on how magic armor should function. For guidance, we referred back to the statement on page 31 of Monsters & Treasure that magic armor effectively reduces the attacker's hit dice. In 20:1 combat, one HD doesn't always equate to one attack die. Light horse attacking light foot, for example, gets two attack dice per hit die. Light foot attacking armored foot gets only one attack die per three HD. We also experimented with treating magic armor as saving throws, a common feature of wargames of that period. If you had magic armor, then you'd roll a d6 for each attack that struck you. Roll equal to or under your magical AC boost and that hit was magically cancelled. This worked if your magical bonus was 3 or less. Go over that and it got excessive. It's our own mod and definitely not something you'll find in Chainmail. Low-level monsters could be lumped into a single hit dice total. Goblins have one hit die apiece, so six of them fight as six men. Skeletons have half a hit die apiece, so six of them fight as three men. Ghouls have two hit dice apiece, so six of them fight as 12 men. With the Monster Table from Monsters & Treasure and the Fantasy Reference Table from Chainmail as guides, extrapolating to new monsters was easy. When using the 20:1 rules, we dropped the idea that a hit equaled 1-6 points of damage except where player characters were concerned. For NPCs and monsters, each hit wiped out one hit die. It's fast, simple, and exciting. This system works much better than the Fantasy Combat Table at low levels and at least as well at higher levels. The best thing about 20:1 is the satisfying way characters mow through low-level foes. Second best is how these rules shine in big fights. A battle with six PCs plus a dozen men-at-arms against a giant and 20 orcs is a snap. That shouldn't be surprising, since this combat system is the core of a wargame. Part of why 20:1 combat works smoothly is that it's almost all Chainmail. You don't need to mash two games together the way the FCT and M2M rules demand. Eighty percent of the questions are eliminated right there. Man-to-Man Combat is where everyone wants to go, and it's easy to see why. The M2M rules are tactically rich without getting too complex. They're more involved than the FCT, the 20:1 rules, and even the alternative combat system, but by modern standards, they're still refreshingly sparse. Two pages of rules, two tables, and you're done. The M2M table works very well when used as it was intended--for fights between normal humans who wear armor and swing weapons at each other. Even with the complications of multiple hit dice, magic weapons, and magic armor, it still works, albeit creakily. Everyone uses the numbers on the table, regardless of level. A hit does 1-6 damage (as with 20:1, we assumed that any hit against an NPC or monster with 1 HD was a death blow and didn't bother rolling damage--it saved lots of time). Magic weapons and armor were direct adds to or from the attack roll, making anything above +1 very powerful, thanks to the 2d6 bell curve effect. Sadly, when you introduce monsters that grow their own armor and weapons, M2M breaks. It's based on specific weapons attacking specific armors with no provision for natural weapons or armor. What's more, the progressions aren't linear. The mace, for example, is more effective against plate armor than against leather or chain mail, and the flail and halberd are pretty devastating against everything. Armor is sort of easy to fudge; just look at the creature and decide what it equates to. Plate armor for a gorgon? Looks about right. Volume 2 equates gorgons to plate + shield. OK, I guess those horns would be hard to get past. A troll looks like the equivalent of leather armor, or leather + shield if you assume that it does a lot of blocking with its arms (who cares if they get chopped up; they'll grow back). But wait, volume 2 gives trolls AC 4, equivalent to chain mail + shield. We can buy that if all those buboes on their skin act like brigandine. What about nixies? Volume 2 gives nixies AC 7, the equivalent of leather armor, but aren't they basically mermaids? OK, maybe their skin is toughened from soaking in salt water 24/7. Then we get to vampires at AC 2--plate armor? That's easy to accept using the ACS, because the book states up front that the tables account for factors besides strict weapons and armor. It's hard to rationalize on the M2M table, where plate armor acts differently against different weapons. The vampire as we picture it should be, at best, padded/leather armor + shield (blocking with its arms or swirling cape), but it should also have some supernatural protection that makes it harder to hit than its armor strictly dictates. The vampire's not alone in having this difficulty. The stew gets worse when natural weapons are tossed into the pot. A gorgon attacks with its horns. Is that like attacking with a sword, spear, or mounted lance? What about a troll? Are its claws equivalent to daggers? Hand axes? Maces? Questions like these aren't simple intellectual puzzles when your character's survival hinges on the answer. We got into ugly arguments over them, and I doubt we were alone. One solution is to expand the table by adding a few lines for natural weaponry--claws, tentacles, teeth, horns--plus a few lines for natural armor--thick fur, carapace, bony integument, artful dodger. That's a pretty good solution, if everyone is happy with the expanded table and agrees to abide by it. The DM can still introduce minor variations suggested by the Monster Reference Table, but he's not making wholesale improvisations. We made such a table and tuned it nicely; I wish I still had a copy of it. Another solution is to just use the M2M equivalent of whatever AC the Monster Reference Table assigns and swallow the oddities. You wind up making a lot of yucky faces and you still argue about weaponry, but at least the arguments are cut in half. Leadjunkie, in his email, suggested another approach. In it, he gives everyone multiple attacks equal to their hit dice against every foe, not just those with 1 hit die. Magic armor reduces those attacks by a number equal to the armor's bonus. If a monster's apparent armor and its AC from the Monster Reference Table in Volume 2 are different, then the difference is applied as a magical bonus to cut down the number of incoming attacks. For example, nixies, with a listed AC of 7 (leather) and an apparent AC of 9 (no armor), would be attacked on the M2M table as unarmored, but each attacker would lose two swings. I'm sure that's not the "official" way it was ever done in Lake Geneva, but it's an interesting interpretation and as worthwhile an experiment as anything I've suggested here. I look forward to chatting with Marshall at NTRPGCon about how it worked out. We recognized pretty quickly that none of the Chainmail combat systems offered a one-size-fits-all solution. Each was suited to a different situation, and that's how we used them. The M2M table came out when we fought men or humanoids who used armor and weapons. The 20:1 tables came out in big fights, when we had a team of men-at-arms in tow, and when we felt like wading through low-level monsters, knee-deep in gore and surrounded by heaps of corpses. The Fantasy Combat Table was a novelty. It didn't offer much excitement, and it didn't see much use. That's a pretty good summation of the best and worst of OD&D; it couldn't be played without making a lot of interpretations and assumptions, but you could make a lot of interpretations and assumptions and play the game exactly as you liked. The interpretations here are the ones that my friends and I used, as best I can recollect them. They're not TSR-approved, they're just the way we played. I can't wrap this up without linking to three excellent resources for anyone interested in experimenting further with Chainmail. Using Chainmail to Resolve OD&D Combats takes a much more exhaustive look at all three systems with an eye toward analyzing the official way to handle it. I'm not in 100% agreement with all of Aldarron's conclusions, but that's what makes these sorts of analyses fun. Scroll to the bottom of the page to access the Chainmail material. While you're there, look at the other offerings, too. This adaptation of the 20:1 rules is something that I ran across a few years ago. 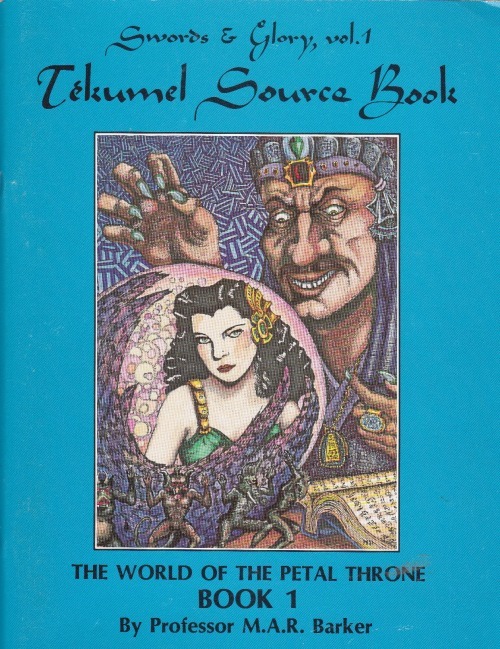 I don't recall where and I can't track it down online now, so I'm making it available here. If anyone knows of a current link, or a reason why it shouldn't be offered here, let me know and I'll update. Finally, there's Searchers of the Unknown by Nicolas Dessaux. This has nothing to do with Chainmail, but it's a terrific adaptation of OD&D-style gaming into rules that are exactly one page long. It only covers fighting men, but there are "expansions" to bring in lots more, if you can stomach all that complexity. The character sheet is a work of genius. Highly recommended from the Howling Tower. Fantastic work, Steve. I began playing in September of '76, with a friend who had the rules and always DMed. I never tried to "get behind the screen" until we went our separate ways 2 years later (we were both Navy brats). By the time I bought it all for myself I was buying AD&D and forming my own group of neophytes in Virginia Beach. The point of that is that I never considered Chainmail combat until relatively recently. Now that I have, I am in a love/hate relationship with it. I desperately want to love it because not only does it seem like a very fun, unfettered way to play, I also want to "play at the source", as it were. I hate it because not only is an official method unclear, it isn't even clear how to house rule it. There is definitely more love than hate, though, and articles like yours always renews my faith that it can be done. Steve, I just finished going through the links you provided. I love the second one, as it strikes me like a crayon drawing of how to use Chainmail combat (which is how I need it). May I post a link to it on my blog? I didn't want to include it in my blog in any way without asking. Be my guest. The only caveat is that it's not my work and I no longer have a link to where I got it, so I don't know whose it is. Should the author show up and ask, I'd have to take it down. Unlikely, but you never know. In the meantime, I'm all for getting it into as many hands as possible, because it's excellent. Apparently the Chainmail Fantasy Combat Table has almost the same numbers as in the Dungeon! board game. So perhaps you could find some new information there. With Fighters, perhaps you could extrapolate the difference between Superhero and Hero. For example a Ghoul needs a 9 to kill a Hero and an 12 to kill a Superhero. So maybe it needs a 6 to kill a Man.